Plyometric Cardio Circuit is one of 10 DVDs that come with Insanity by Shaun T, the 60-day total body conditioning fitness program. In 40 minutes, the Insanity plyometric workout will have you burning fat with intervals of intense lower-body plyometrics and sweat-inducing cardio! Each Insanity workout begins with a warm-up. Wow! The Plyometric Cardio Circuit warm-up alone could be a complete exercise routine for most people! Shaun T starts you off with jogging, running, jumping jacks, power jumps, and other exercises to get your heart rate up. You do the Insanity Plyometric Cardio Circuit warm-up 3 times, going faster each time! Next is some well-deserved light stretching. If the stretching is not enough for you, you can always stretch on your own prior to the workout. Shaun recommends a heart rate monitor for all Insanity workouts, including the plyometrics workout. Monitoring your heart rate is the easiest wayan easy to keep yourself working out in the right “zone”. It helps you reduce your chance of injury or overtraining and also help you get the results you want. 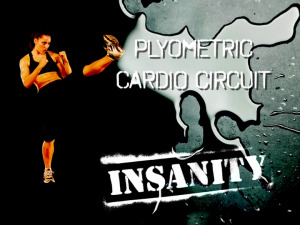 The Insanity Plyometric Cardio Circuit workout will have you burning calories like nobody’s business! 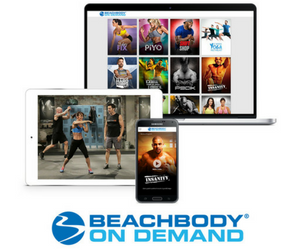 Shaun T pushes you to new levels of fitness by having you run, jump, and dig deeper than you ever have in your life. You also be doing exercises like deep squat jumps, mountain climbers, and ski jumps. The mountain climbers are different than the ones in high school – with these, you’re standing up and alternating pulling your arms down while running, basically. With the ski jump exercises, you mimic a downhill skiing motion while jumping from side to side. The best part of all is that this program requires absolutely no workout equipment like resistance bands or dumbbells! 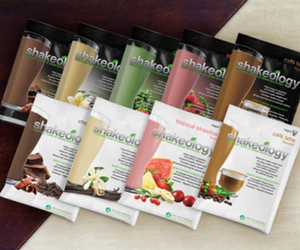 Are you ready to take the Insanity challenge? Get Insanity with Shaun T.